The idea of universal basic income (UBI) has been widely discussed in recent years. Essentially, it means giving free money to everyone — unconditional of means and unattached to work requirements. While UBI is rooted in a bottom-up mindset, the concept has been adopted and modified by political parties, economic leaders, and Silicon Valley doyens. With ever-scarier scenarios of automation-caused unemployment, with economic and social insecurity, UBI became a necessary solution. However, this notion of universal basic income lacks diversity: it lacks plural futures and it lacks public imagination in shaping them. 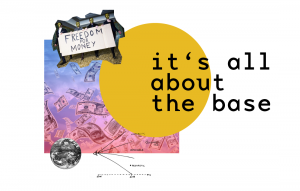 it’s all about the base provides an overview of how UBI functions and its possible impacts. It’s based on a design methodology of participatory design fiction with Parisian residents as key participants. Interviews serve as a springboard for practical work. The project, which started as a Master thesis titled “it’s all about the base: towards Public Imagination through Participatory Design Fiction” in the MA program Design for Social Impact at Paris College, aims to create experiential design fictions that contribute to making sense of UBI-futures. This project explored questions regarding UBI with near-future fictional organizations and scenarios that prob a society in which universal basic income has been implemented. They ask how we can trust that others will spend their money well, how we form identity and social participation in a post-work era and what societal value we devote to labor and leisure? Astrid Lindgren’s heroine Pippi Longstocking adventured many blue sky dreams. From the lemonade tree, over spectacular chases with the police on the rooftop of Villa Villekulla till adventures with pirates in Taka-Tuka-Land. Pippi does not have to worry about financial issues — quite well covered with a treasure full of gold coins. This dream of freedom and financial security does not remain pure fantasy. It manifests itself in the idea of a universal basic income (UBI). Essentially, it is the idea of giving free money to everyone, unconditional of means or requirement to work. A basic income covers all basic needs such as shelter, education and food, to ensure a life of dignity and freedom. This seems to be far from reality and a rather utopian dream. This, in fact, is precisely where UBI has its origins: in Thomas Morus’ Utopia from 1516. The idea of universal basic income is not a new concept and has been discussed throughout history in a variety of forms, perspectives and motivations. Today, ecological, economic and social crises like climate change and the financial crisis demand new solutions. One of which lies in providing financial security and societal participation through a universal basic income. These fears of uncertain futures are fueled by automation and the picture of the job stealing algorithm bot. Whilst this fear was formerly focused on low paid unqualified jobs, with the rise of artificial intelligence (AI) also so called high qualifying jobs are at risk. A recent Oxford University study numbers jobs in the US susceptible to disappear at 47% and 54% of all those in Europe. This turns basic income into an inevitable necessity for a jobless future with full automation and robotization. “The new disease” of “technological unemployment”  was already prophesied in 1930 by John Maynard Keynes. Today, ecological, economic and social crises like climate change and the financial crisis demand new solutions. One of which lies in providing financial security and societal participation through a universal basic income. These fears of uncertain futures are fueled by automation and the picture of the job stealing algorithm bot. Today, Silicon Valley visionaries like Elon Musk draw pictures of high-tech futures. However, aside from the technocratic utopias or pessimistic mass unemployment forecasts, providing everyone with a basic income is now, quite simply, feasible — at least in Western countries. Global prosperity has never been so high. This wealth and prosperity is just not distributed effectively. In other words, as entrepreneur and director Daniel Häni frames it: “Of course it [UBI] is financially feasible. There is not a lack of money.”  On first sight, redistributing wealth in the form of a universal basic income applies more to left-wing politics and ideals. For example, the idea was campaigned for by the left-wing candidate Benoît Hamon during the French presidential election in 2017. However, neo-liberals  also make a case for UBI in favor of a slicker welfare state and free market. As much as political perspectives vary, so do the people behind the debate: Economics Nobel Prize awarded Sir Chris Pissarides speaks to a much different audience than the people-driven Mouvement français pour un revenu de base (MFPR) (French movement for a basic income); or the internet lottery Mein Grundeinkommen  (my basic income) in Berlin with its start-up mentality. Despite being united in the goal of universal basic income, its advocates depict a very different idea of human nature. How humans behave in the context of UBI has been tested in a series of pilot projects and experiments. Whilst most of these are conducted in emerging economies like Kenya or Namibia, Finland  started the most famous pilot in a European context in 2017. For this pilot, around two-thousand long-term, unemployed people are receiving a monthly amount of cash over two years. As the first country, Switzerland gave its citizens the opportunity to vote on UBI in their 2016 referendum. Although the referendum decided against UBI, with around 23% of voters in favor of the idea, it set the ground for UBI as a concrete policy. The question — The Biggest Question in the World — raised during their campaign still remains: “What would you do if your income were taken care of?”  The actual implementation of such a cash policy feels far from reality for most people and, therefore, the answer to this question appears rather abstract. As the UBI-E FutureLab, the European initiative for universal basic income states, the debate remains “only at a mere abstract, utopian or academic level.”  Due to its entrance into politics, universal basic income also became subject to ideological and political left and right thinking. Under these conditions the future of universal basic income is a singular and predetermined one. This future lacks plurality and must diversify into futures. And further, these futures require people’s participation: they require public imagination. This lack of public imagination narrows the possibilities of futures. Possible impacts on diverse dimensions of life remain underestimated. If we — as citizens — cannot create public imagination around UBI, it is likely to be exploited by ideological interests, possible effects run risk of being disregarded, and it will remain a non-actionable theory. Thus, public imagination allows one of the most positive visions at the moment — the universal basic income — to prove itself. Therefore, it is essential that we engage with the idea to make sense of our futures. “I think we have a chronically impoverished practice of public imagination,” states Stuart Candy, professional futurist and associated professor at the School of Design at Carnegie Mellon University. The lack of public imagination leaves us with “underimagined, clichéd — or absent” alternatives and choices, which are essential for true democratic participation. Therefore Candy asks for “creating structures of participation for co-imagining.”  The notion of public forms a collective anti-pole to future scenarios produced by professionals or politicians. These ready made futures must be challenged by asking: “who’s future is this?”  An example of the power of public imagination can be found within the Arab Spring in 2011. For one day, newspapers and radio stations reported on hypothetical futures and stories three years ahead. #16juin2014 fueled the public debate and crucially influenced the mood, situation and action of people towards optimistic visions. So what to do with all these futures, and what has design to do with it? Design Fiction constructs experienceable future scenarios to engage, mediate and provoke people in order to stimulate debate and to open the scope of what is possible. It does so by materializing speculations and making ideas tangible. Bringing these futures back to the present allows us to make sense of future ways of living before we actually get there. For example the studio Superflux  created different air samples to experience different environmental policies and their potential consequences on air pollution: smell the future. It makes us understand the what if what data and predictions often can’t. So what if we had a universal basic income? I wanted to understand better what effects UBI might have in a political, economic, socio-cultural, environmental, technological and legal dimensions. And of course I wanted to know how people imagine them. So I asked them. I met experts in each of these dimensions and we explored the effects of UBI on their specific fields. I met Fabien who works with SynLab, an organisation dedicated to innovation in the education sector. We discussed what happens if UBI changes the working world. When school prepares children for the real world, the working world, how would they then change? Universal basic income has the potential to rewrite the economic narrative of limitless growth on a limited planet. Can UBI be a driver towards economics without growth? Degrowth? An economics class on degrowth is currently taught at SciencePo. Manon studies in this course and we discussed the intersections of both movements – degrowth and UBI. Universal basic income will not affect everyone equally. So does gender. The debate about basic income has actually a long history in feminist movements. Spokeswomen on the one hand see it as a tool for emancipation and on the other hand critics fear the household trap. Will UBI break with traditional gender roles and allow us to experiment what we perceive as family? With Luisa*, Leo and Alma*, the founder of Paris Women in Energy and Climate network we discussed UBI’s meaning for women. The question of how actually the money gets to the people leads very fast to the debate of blockchain distribution. The decentralisation of the blockchain could work around the bureaucracy state. Some advocate for blockchain distribution, because UBI is just too powerful to leave it in the hands of the state. Which is vulnerable to abuse its power. To dive into the potentials and risks of the blockchain world I met Jérôme. He is the founder of KIZO, the “digital wallet to do good.” Kizo generates donations by making purchases via blockchain. Universal basic income is not left or right. It can be justified from a wide spectrum of values. From a liberal-egalitarian perspective for a smaller state. Or from the Declaration of Human Rights, where “Everyone has the right to a standard of living.” Thomas Pain argued that everyone has natural rights to the earth and a basic income functions as a sort of endowment for it. With Daniel, Harvard and Sorbonne graduate lawyer we casually drafted a UBI bill. Q#1 Can we trust others in spending their money well? Can we bare that others make decisions with their freedom we might not agree with? And comes with freedom also responsibility and ownership of decisions and future making? Q#2 Work is essential for our social participation and how we identify. How we find meaning in what we do. Where will we find social participation and identity in a post-work society? Q#3 When work is a decision not a default with UBI, we have to decide how we want to spend our time. Do we need to rethink leisure and the dogma of labor and their societal value? So I created three design fictions exemplifying these questions in a world where we have an implemented UBI. The Children’s Bank (CB) is Europe’s first bank exclusively for children. Invest today with Children‘s Bank and make money work for the future — because it is yours. Ever since our creation in 2028, we at CB strive to serve our clients the best way possible. We believe in children‘s money souveranity and in their capacity in shaping the future. You are many: In France live 70 million people. 18% of them are under 15 years old – you. This means in total you are 12.6 billion children. You have a lot: With the C-UBI (Children Universal Basic Income) every child gains 500 Euro per month. All of you together have 6300 billion Euros per year. You choose what your money does: The CB is truly democratic. So you decide what we invest in. The CB only supports what you want to see in your future. Some of our current engagements at CB are: Candyland: Candyland produces the most popular chocolate bars and jelly snakes in Europe. CB and its members are pleased to support Candyland’s research and development. Free school: CB supports the movement of free schools. Children must decide freely when and what to learn. With its investments CB takes education seriously. Green it up: CB and its clients take on environmental challenges. For a green future the project “Green It Up“ reforests 40,000 acres in the region of Aquitaine. Share your time and care for your community. With Sharing is Caring you gain status points and reach the next level of citizen engagement. Where we all have universal basic income it is time to give back. Allow Sharing is Caring to access your iris to calculate your time availability. Your optimal amount of time to share is ascertained by classic iris data evaluation. See the sharers in your area nearby and request their help. Establish your own status and personalize your favorite caring. Receive notifications if you haven’t cared lately, if your calendar still has some empty time slots or if you are a super sharer for your community. In a world where income is taken care of and work is done by the bots, humans must be freed from the dogma of labor and occupation. Idleness is the highest of all arts of humanity. We demand the right to be idle to be protected by a legal status from local to international instance. 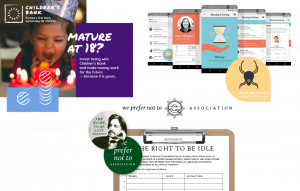 For our current campaign we kindly ask you to sign the petition to “the right to be idle.” More and more people are concerned with the status of leisure in our labor-obsessed society. They are inspired by the we prefer not to association’s recent non-actions such as the manager-shaming. Manager as the epiphany of efficiency and productivity. Therefore they must be denounced in public for the greater good of a truly free society. #hammocking: The social media campaign spread the word about the 230 hammocks that were installed in the city of Paris in a guerrilla action as the symbol of leisure. Apply & Deny: Current job offers looks for labor slaves and clowns. With the apply & deny project you can download the non-application template, apply for the ridiculous job offer and DENY. We prefer not to. The idea of universal basic income is one of the most promising ideas for the future. This future, however, is not predetermined yet. It can be shaped and informed significantly by decisions made today. To allow universal basic income to unfold all of its possible potentials, imagining how it could be is key. Public imagination is crucial to make universal basic income less vulnerable to ideological interests. Design fiction enables people to fantasize, imagine and experience a wide scope of future ways of living with a universal basic income. Futures that are not definite, but highly personal, diverse and peoplemade. These imagined futures become alternatives, as well as choices that can be made in the present, the here and now. More significantly, having and making choices are essential for a real democracy. Engaging with political and societal ideas creates such choices. We — as citizens — must imagine our futures and not rely on visions from Silicon Valley or political parties. We must always ask the question: whose futures are these? Further, current images of the future are rather dystopian. They take ecological collapse, hegemony of lobbyism and the takeover of AI for granted. But are we doomed to accept these forecasts imposed upon us? Or can we reimagine climate change, banking systems or migration in different ways? “And yes it seems she always makes her dreams come true,” lilts Pippi Longstocking riding on her dotted horse. Here lies another significant point: action. Dreams do not come true on their own; it is an active process. Dreaming, fantasizing and imagining are crucial to enrich the scope of possible futures. After which, it is about taking the reins towards preferred directions. Hanna Rasper is a designer in the fields of creative strategy, (info)graphics, and social impact. Her interests include: universal basic income, renewable energy, feminist design, and urbanism. She has worked with Strichpunkt Design, Infographics Group, and Ellery Studio in Berlin. She holds a BA in Media Design and an MA in Design for Social Impact from the Paris College of Art. Starting in September, she will work through the Erasmus Young Entrepreneur program with WEPUSH, a design studio for social and urban innovation in Palermo, Sicily. Theme song, composed by Jan Johansson “Pippi Longstocking (Is Coming into Your Town)” of the same named TV series 1969. Thomas More, Utopia (Harmondsworth: Penguin, 1516/1978). Carl Benedikt Frey and Michael A. Osborne, “The future of employment: how susceptible are jobs to computerization?” Oxford University Press September 17, 2013. John Maynard Keynes, Economic Possibilities for our Grandchildren (1930), 361, (in John Maynard Keynes, Essays in Persuasion, New York: W.W.Norton & Co., 1963, 358–373). Chris, Weller, “Elon Musk doubles down on universal basic income: It’s going to be necessary,” Business Insider February 13, 2017, accessed February 5, 2018, http://www.businessinsider.fr/us/elon-musk-universal-basic-income-2017-2/?op=1. Swiss original: “Natürlich ist es finanzierbar. Es fehlt ja nicht am Geld.” in Free Lunch Society: Komm Komm Grundeinkommen. Christian Tod. Austria, Germany: Golden Girls Filmproduktion, 2017. “Création d’un Revenu Universel d’Existence,” Benoît Hamon, accessed March 22, 2018, https://www.benoithamon2017.fr/proposition/creation-dun-revenu-universeldexistence-3/. Thomas Straubhaar, Radikal gerecht: Wie das bedingungslose Grundeinkommen den Sozialstaat revolutioniert (Hamburg: Edition Körber Stiftung, 2017). Mein Grundeinkommen, accessed February 14, 2018, https://www.mein-grundeinkommen.de/. “Experimental study on a basic income,” Kela, accessed March 28, 2018, http://www.kela.fi/web/en/experimental-study-on-a-universal-basic-income. “Grundeinkommen: die größte Frage der Welt,” Startnext, accessed March 24, 2018, https://www.startnext.com/groesstefrage. 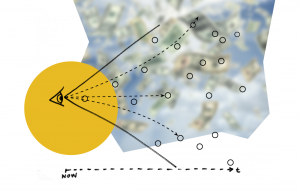 “FutureLAB: Immersing into the idea of basic income,” Unconditional Basic Income Europe (UBIE), accessed February 4, 2018, https://www.ubie.org/project/futurelab/. Stuart Candy, “Dreaming Together: Experiential Futures as a Platform for Public Imagination” Made Up: Design’s Fictions. New York, Barcelona: ArtCenter Graduate Press, Actar Publishers, 2017) (written in 2013): 46–47. Stuart Candy, “Whose future is this?” filmed January 1, 2014 at TEDxChristchurch, video, 19:39, https://www.youtube.com/watch?v=YxgVxu2mdZI. Rutger Bregman, Utopia for Realists. And How We Can Get There (London: Bloomsbury, 2017) 21. Ann Dent, “From Utopia to Implementation: How Basic Income has progressed from radical idea to legitimate policy solution. An exploratory study” (Master diss., University of Bristol, 2017). Fernanda Marin, OuiShare Magazine, interview by Hanna Rasper, January 13, 2018, full interview on demand. “The Future Energy Lab,” Superflux, 2017, accessed March 18, 2018, http://superflux.in/index.php/work/futureenergylab/#.